If you’re in the mood for pink, you’re in for a treat. Today we’re celebrating a “pink-themed” virtual baby shower for Katherine over at Love in My Oven. 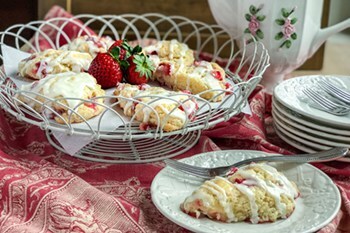 And I’m bringing these oh-so-yummy and pink Buttermilk Strawberry Scones with a Lemon Butter Glaze. While these scones are tasty for baby showers, virtual or otherwise, they’re also perfect for wedding showers, Mother’s Day, spring events, strawberry season… Well, you get the idea. A simple-to-make scone, that’s flaky and tender, with a perfect blend of sweet and tart. Finished off with a Lemon Butter Glaze that brings all the flavors together. Afterall, isn’t that what pink-themed baby showers are all about? That perfect blend of tender and sweet? As a mom who only had a blue-themed baby shower, it’s delightfully fun to do pink. Congratulations, Katherine, on the newest addition to your family! Baby girls are just the most precious little people. Have a scone or two, with tea, of course! And be sure to check out what else is happening at the baby shower below the recipe. 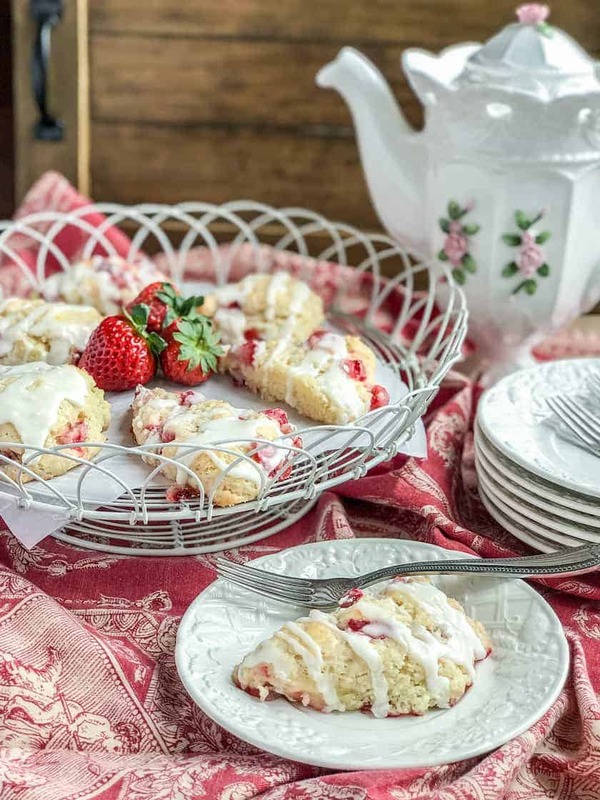 Easy to make, sweet and flaky, these Fresh Buttermilk Strawberry Scones are everything you love about the season. Make a batch and enjoy with a cup of tea! 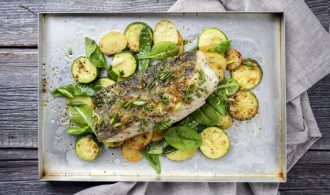 Preheat the oven to 425 degrees F and line a rimmed baking sheet with parchment paper. Fold the strawberries into the dry mixture and coat. Make a well in the center and pour in the buttermilk. Fold the ingredients until it is just incorporated. Be careful not to overwork the dough. Transfer the dough to a floured surface and divide into 2 parts. Roll each part into a round shape about 3/4-inch thick. Cut each disc into 6 wedges and place slightly separated on the prepared baking sheet. Bake for 14-18 minutes, or until the top begins to turn golden brown. For the glaze: combine the lemon juice, confectioners’ sugar and melted butter in a small bowl. Whisk until the lumps disappear. Once the scones have cooled, drizzle each scone with glaze. You don’t need to know Katherine to join in the fun, just enjoy all of the pink-themed recipes the bloggers are bringing to the party! 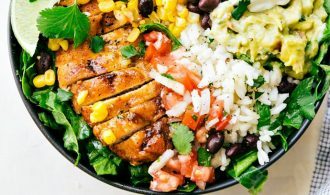 Scroll down to see what the bloggers are sharing, and click on the links to hop over to their blogs to check their recipe out. I love making scones and these look just lovely. I can imagine sitting with one of these and a nice cuppa, baby shower or not. That’s exactly how I feel — scones and cuppa make the perfect, perfect combination. For all occasions! Beautiful flaky, buttery, and rich scones. Love the addition of strawberries and luscious lemon glaze. They perfectly balance the richness of the scones. Well done! Thank you so much, Ben! I love scones for just that reason. Add strawberries — and it’s heavenly. Thanks also for your help with the alerting me to the comments! I never met a scone I didn’t like! And strawberries are my favorite so I’m sure I would love love these. Perfect for a baby shower! I must admit – I have a couple in the freezer for those 3pm pick-me-ups. They work SO well 😊😊. Thanks!! So beautiful, Stephanie!! Your recipes are such down home goodness! Love every single one!! Keep ’em coming!!! Want to have these on hand at all times!! So buttery and glazy delish Stephanie! Pinning as my go-to scone! I have to admit — I have some in the freezer for those days that need a little sweetening 😊! Thank you so much! And I’m with you — I love scones for breakfast :)! 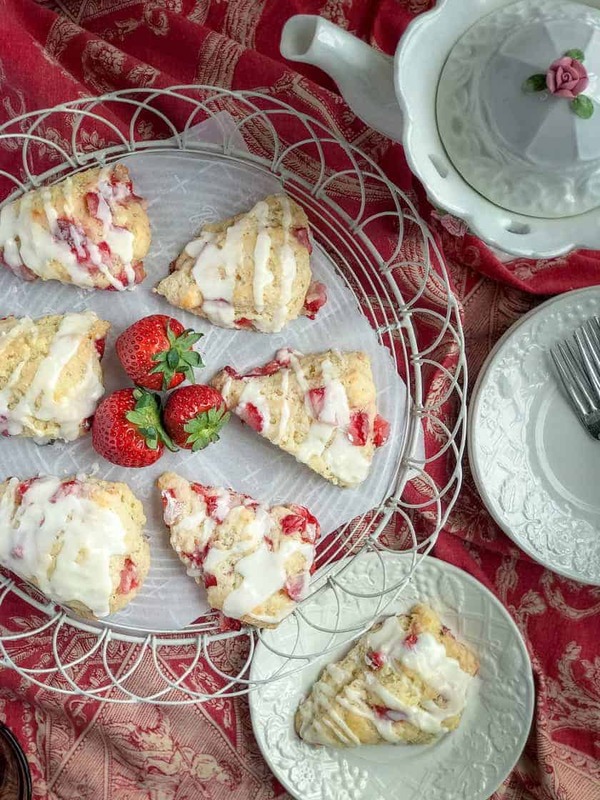 These strawberry scones look absolutely divine. I’ve tried making scones in the past and either they flattened and lost their shape or came out too dry. But these, look perfectly tender with the right amount of moisture. I’ll have to pin this recipe for a future date. Kelly, thanks so much for asking me to participate. You did a great job organizing all the details! Plus, the recipes have been so fun to print, pin, and save! I love scones and these look just delicious! Perfect shower fare! Thank you so much, Kelsie! I love them too 😊! Yum! I was just thinking I ought to make some scones this weekend, and this particular recipe looks absolutely lovely – perfect for spring and any party, but especially for welcoming a new baby girl! Thank you, Monica! Scones are always a welcome addition to a party — and I agree, especially for welcoming a new baby girl! Yes to strawberry scones! These look amazing! great for a baby shower!